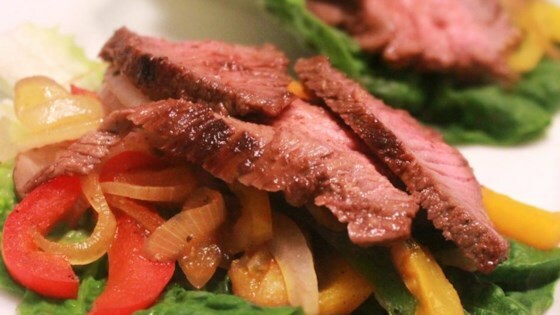 "These fajitas are my husband's favorite quick-and-easy dinner. They are so tasty! If you do not have the time to marinate the meat for 2 or more hours, just leave it out at room temperature, keeping the bag zipped tightly for about 20 to 30 minutes. Serve with sour cream, Cheddar cheese or Monterey Jack cheese, and lime wedges." Grind garlic with kosher salt with a mortar and pestle until a paste forms. Whisk garlic paste, lime juice, olive oil, cilantro, chili powder, sugar, paprika, and cayenne pepper together in a bowl; pour marinade into a resealable plastic bag. Add skirt steak strips, coat with the marinade, squeeze out excess air, and seal the bag. Marinate in the refrigerator, 2 hours to overnight. Remove steak from marinade and shake off excess; discard remaining marinade. Preheat oven to 300 degrees F (150 degrees C). Wrap tortillas tightly in aluminum foil to form a packet and place packet on a baking sheet. Bake in the preheated oven until warmed through, about 10 minutes. Keep warm. Heat 1 teaspoon canola oil in a large skillet over high heat until oil begins to smoke. Saute onion and bell pepper in hot oil until browned and almost tender, 4 to 5 minutes. Transfer onion and pepper to a plate. Heat 1 teaspoon canola oil in the same skillet over high heat until oil starts to smoke. Cook 1/2 of the steak in hot oil until browned on all sides but still pink in the center, 4 to 6 minutes. Transfer cooked steak to the plate with onion and pepper. Heat remaining canola oil in the same skillet. Cook remaining steak in hot oil until browned on all sides but still pink in the center, 4 to 6 minutes. Stir cooked steak, onion, bell pepper, and any accumulated juices back into the skillet. Add minced garlic and salt; cook and stir until fragrant and heated through. Remove from heat. Divide steak mixture between warm tortillas. You can use any color bell pepper, if desired. You can use light olive oil in place of canola oil, if desired. You can use flank steak or chicken in place of the skirt steak, if desired. You can use any tortillas instead of whole wheat tortillas, if desired. My husband raved about the marinade's flavors. The only change I will make next time is to marinate overnight. The skirt steak was still kind of chewy. Excellent! This meal was so delicious that it prompted me to write my first review here! So yummy and tasty. Thank you for sharing this great recipe. No changes. I might try grilling instead of using iron skillet next time, not sure how that would work with the marinade. Easy peasy. Although I did add cumin and used lemon juice instead of lime.